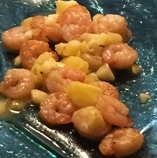 This recipe for cumin-spiced shrimp with mango was in Coastal Living and has been in my database for a while. It turned out to be quite good and made for a very nice Saturday dinner. Of course I omitted the cilantro, as Terry doesn’t do cilantro. I improvised on the lime-cumin vinaigrette as I had failed to save that recipe, but I have it now in case I want to try the recipe again. It was, I will say, a tasty dish.